Peripheral neuropathy can be caused by many things such as poor blood flow, prescription medicines, trauma, and environmental toxins. No matter what the cause, the ReBuilder may be able to reduce your symptoms, stop the progression of the disease, and in some cases, even reverse peripheral neuropathy. The ReBuilder can eliminate the pain in your feet and legs from neuropathy, or your hands and arms, including (but not limited to) neuropathy from chemotherapy, peripheral vascular disease, trauma to the lower back, piriformis syndrome, and diabetes. The ReBuilder delivers an electronic signal that travels from one foot, up that leg, across your back, down the other leg, and to the other foot. The delivery of this signal helps improve the communication from one nerve to the next resulting in the reduction, and often the elimination, of the pain and other symptoms you are experiencing. It will also improve circulatory response and oxygenation in the treatment area. The ReBuilder has been in production for 27 years, prescribed by over 12,000 physicians and used by over 300,000 patients successfully. It is made in the US, in an FDA accredited facility, by US citizens. The ReBuilder has spawned a succession of substandard me too imitations made in China that have come and gone over the years, simply because they cannot do what the ReBuilder does. Always have your physician prescribe Brand Specific” ReBuilder products and accept no imitations or generic substitutes. Proven Up to 95% effective for relief of painful symptoms of neuropathy, MS, RSD, restless leg syndrome, sciatica, piriformis syndrome, arthritis, and other forms of chronic pain. 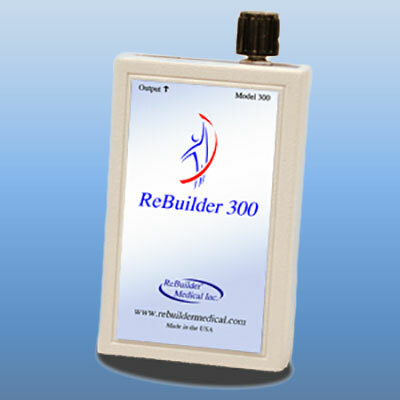 The ReBuilder is manufactured in the US, by US citizens, in an FDA registered and inspected facility. Accept no substitute. Your ReBuilder is even warranted for your lifetime and can be inherited by your children. If your break it or lose it, or for any reason, it is covered. How Does The Rebuilder Work? 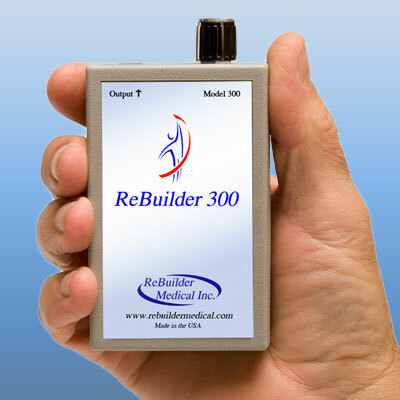 When you first turn your ReBuilder on, it sets its output parameters for your physical mass by measuring the electrical analog and digital impedance of your body. It knows if it is treating a 125 lb woman or a 350 lb man. If you use the ReBuilder directly on your lower back, it knows that. You would obviously need a different amount of signal for variations like these. This is a unique safety feature of the ReBuilder. No other unit offers this level of safety. The ReBuilder then sends out a test” signal that represents the most common waveform for healthy peripheral nerves. This signal goes from one foot, up the leg to the nerve roots in your back, down the other leg, to the other foot. It then waits for an echo-like response from this initial signal. This phenomenon is similar to the patella reflex when your doctor hits just below your kneecap with a little rubber hammer and your leg kicks out. When this initial signal reaches the other foot, an automatic response sends a signal back to the ReBuilder. The ReBuilder analyzes this returned signal in a split second and analyzes for returning waveform for differences. Just as a Cardiologist can take one look at the shape of the signal displayed on the EKG monitor above the patients bed in the hospital and diagnose what is wrong with the heart, we have been able to identify that the peripheral nerves have a very particular shape to its waveform, and we can diagnose the nature of the problem from analyzing that waveform. This feature is built into the ReBuilder and processed by its internal microprocessor. Abnormalities in the shape of the waveform on the way up indicates issues with numbness; the shape of the top of the waveform indicates the ability of the nerve to deliver the signal long enough for the brain to receive it all; abnormalities in the downward slope of the waveform indicates pain, and the shape of the refractory period below the baseline (as the nerve cell repolarizes itself) indicates the ability of the nerve pathway to prepare for the next signal. The ReBuilder then creates a compensating waveform (similar to the Bose headphones that cancel out the background noise on airplanes). 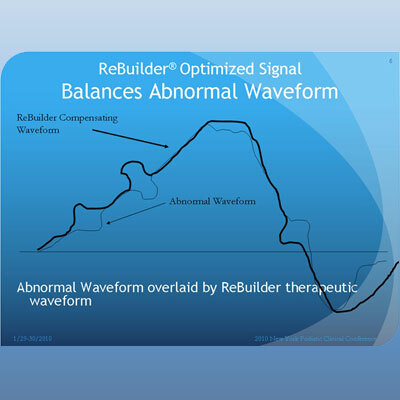 Where there is too much energy displayed, the ReBuilder adapts the treating waveform to reduce that energy. Where the waveform indicates too little energy, it increases the energy in that area. This process goes on 7.83 times every second, sending a signal, analyzing the returning signal, creating a compensating signal, and sending this new signal. The reason for the 7.83 Hz frequency is that it takes time for the nerve cell to re-polarize (or reset) itself between its transmission of nerve signals. Minerals have to squeeze through little holes in the cell wall, and then return. This takes time. We have found that if we slow down the treatment to 7.83 times per second, it gives the nerves time to re-polarize and get ready for the next signal. A common TENS signal uses an unnatural, uncontrolled, simple signal 90 to 100 times per second precisely to stop the nerve from operating. This may temporarily give some pain relief, but can cause more numbness, and can permanently damage the nerve cell possibly resulting in permanent paralysis. In effect, the ReBuilder acts like a pacemaker works for your hearts electrical signals. If the pacemaker does not send exactly the right signal, then the four chambers of the heart may not pump in the right order and if the signal is too fast or too slow, the heart stops. So, too, the ReBuilders precisely controlled waveform coaxes your nerves to transmit their signals in the proper order. Although essentially similar to TENS relative to the FDAs regulations, the ReBuilders signals are vastly more controlled and precise. You can think of the ReBuilder as a pacemaker for your nerves. What about difficult to treat patient who havent responded to other forms of therapy? What about FSM, LED, Laser, Interferential, and Infrared socks? Why hasnt my doctor told me about the ReBuilder? Does the ReBuilder treatment hurt? What does it feel like? Do the conductive socks give the same stimulation as putting your feet in the footbath? How will I know when it is working? The ReBuilder seems expensive, why is that? Can everyone use the ReBuilder? Will it keep me from getting neuropathy if I am on chemo now? What about difficult to treat patients who havent responded to other forms of therapy? Answer: Many of your patients will come in asking I have been told there is nothing I can do. What makes this program different?” For most, pain is completely eliminated during treatment. After the treatment, the pain is usually diminished about 50%, and numbness/tingling is reduced for 4-5 hours as it gradually returns to a slightly less painful level than when you began the treatment. With continued use, the level of post treatment relief improves, and the beneficial effects will last longer and longer. Usually, after about 6-8 weeks of 2 daily treatments for 30 minutes each, you will be able to reduce your treatments to once per day, and then to 2-3 treatments per week for maintenance even when other forms of therapy have failed. My Neurologist performed a Nerve Conduction Velocity (NCV) and EMG. Whats Next? Answer: An NCV test records the speed at which the nerve impulse travels a specified distance. This relates to the diameter of the nerve and the degree of myelination (insulation) on the axon of the nerve. Since it shows the condition of the best nerve fibers, damaged nerves may not be indicated by the test in all cases. An EMG test looks for electrical activity in the muscle during contraction. This may help differentiate between nerve damage or dysfunction and neurological disorders. Both of these tests will simply confirm what you already know, your nerves are not working properly, and because of it, you feel things you shouldnt (pain, burning, tingling) and dont feel what you should (numbness). It may also tell you that your nerves and muscles are not communicating properly with each other, again something you already know. Answer: There are a lot of different medications that will help cover up the pain. Anti-depressants, anti-convulsants, and narcotics are often used. Unfortunately, as they numb the pain, they numb all nerve sensation, contributing to your diminished sensory perception (numbness) which may adversely affect your balance and gait, among other things. These drugs are not a solution, just a cover up and as your body becomes more acclimated to them, dosages will increase, as will their side-effects. The ReBuilder can control this pain without drugs or side-effects and in most cases, with time and use you may be able to reduce the amount of treatment you do as your condition improves. Answer: Thousands upon thousands of successful cases say otherwise, but lets face it, as hard as it is to believe, in most cases your medical doctor is not a specialist when it comes to Neuropathy. He doesnt keep up on the latest techniques and equipment for specialty cases like Neuropathy. Their knowledge is usually limited to prescribing medications. Answer: The ReBuilder signal can be applied in 3 ways; with adhesive pads (1 on each foot), with the footbath, or with the conductive socks. Both the footbath and the conductive socks distribute the ReBuilder signal over the entire foot, while the adhesive pads deliver it to the small contact patch made by the pad itself. The footbath and the conductive sock will yield better results, particularly to the toes and the top of the foot. The footbath is included in the basic kit, while the socks are an optional accessory considered for the sake of convenience with regard to travel, seating position during treatment, or physical limitations in handling the footbath. The footbath is not a spa, massager or soaker. It is not one of those detox baths, you see on TV where the water turns brown (whether your feet are in it or not). It is merely a means to deliver the ReBuilder signal. You can not substitute your foot massager or your existing soaker in its place, as the electronics may interfere with the ReBuilder operation. In order to function properly, the feet must be isolated in separate compartments. Answer: Laser and LED therapy are designed to perform deep tissue warming, which vasodilates thereby enhancing blood flow. They may also stimulate ATP production which is what your cells use for energy. They do very little, if anything, to stimulate the nerve itself. This sort of treatment is an excellent adjunct to ReBuilder stimulation, and is in fact used by many physicians alongside the ReBuilder. It is however, not a cure on its own. Interferential and FSM make no sense. Any frequency higher than 7.83 Hz can cause the nerve to go into fibrillation (like a heart attack) and stop functioning. That is how a common TENS does its job of negating pain while in use. The ReBuilder works at a frequency which properly allows the nerves to re-polarize between signals. Interferential devices claim to aim two different signals at the same target and when these two signals meet they stimulate that exact point. Because neuropathy involves all the nerves from the lumbar area down to your toes, any local treatment is doomed to fail. 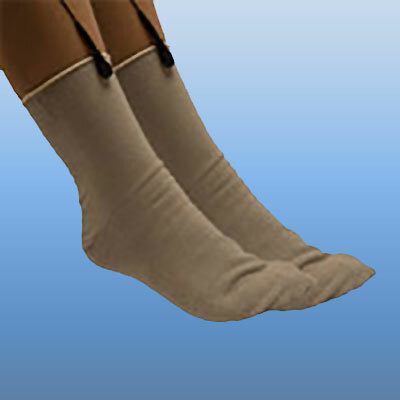 Far Infrared socks claim they work by first, by reflecting back the heat generated by your own feet, and secondly, by working as a compression stocking to reduce edema and increase circulation. If these were a cure for neuropathy, any pair of tight socks and wrappping your feet in tinfoil would cure neuropathy! Answer: If your physician has kept up with new medical developments he will have told you. Many physicians today are so busy that they sometimes neglect to follow new technology. One way we can reach these doctors is when you request a prescription for the ReBuilder. That triggers him to begin researching the ReBuilder and the vast majority of doctors will provide you with the prescription. Then they begin to prescribe it for treatment of their other neuropathic patients with pain, once he observes how well it has worked for you. The ReBuilder is a new twist on existing technology. Both EMS and TENS have been around for years. Your physician should be familiar with TENS and EMS. The ReBuilder is the first and only device to combine them in this unique way, improving the design of the TENS signal to allow for biofeedback circuitry which automatically adjusts its waveform. Answer: The ReBuilder feels good. The signal feels like a tiny tingling massage, that quickly pulses on and off. You can manually adjust the intensity setting for maximum comfort. Answer: Yes, they perform the same function, stimulating the entire foot including the toes. 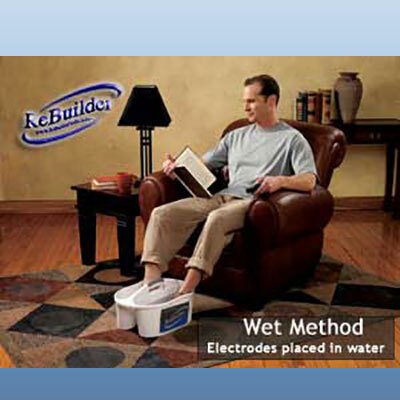 We developed them for those who have a little trouble managing the footbath physically, or for convenience of travel. With the conductive garments (socks or gloves) you can treat yourself in bed, at the office or at home with your feet up on the couch. The footbath is sometimes physician directed for those with severe circulation issues, as the warm water causes vasodilation, further increasing blood flow in the feet. Answer: As for the ReBuilder itself operating properly, the ReBuilder has an indicator light that lights up every time a signal is sent. This will tell you if the unit itself is generating a pulse. To test the wires that lead to the signal pads, you can apply the adhesive signal pads to your forearm (a few inches from each other) and slowly increase the intensity setting until you can feel it. Always be sure you have a good battery installed. As for whether your ReBuilder is working to reduce your symptoms, this can be a subjective analysis based upon your particular set of symptoms. Usually, during the actual 30 minute treatment session, the sensation of pain will be totally gone, and then you will experience a significant reduction in pain for 4 to 5 hours along with a reduction of numbness. This level of post treatment relief will gradually increase in effectiveness and duration with each successive treatment. If you are taking any pain medications, your reduction of numbness may take longer, until you are able to reduce your prescriptions with the help of your physician. Answer: The ReBuilder is a very sophisticated, highly technical medical device that performs more functions than a pace maker. It is microprocessor controlled with a tiny computer chip that has more computing power than your iPhone®. It is relatively inexpensive compared to this similar technology. Because you can likely reduce your current medications (average is $877 per year), and avoid surgical interventions etc., the ReBuilder pays for itself in no time. Add to that, the value of maintaining your mobility, freedom and independence, the ReBuilder is truly one of lifes real bargains. Answer: The ReBuilder is safe for almost everyone. As with all medical equipment we suggest that pregnant women and children should not use the ReBuilder. The ReBuilder is safe to use with all non-electric surgical implants such as screws, plates, pins etc. It is contra indicated for patients with certain pacemakers, especially those with the defibrillator accessory. You can check with your cardiologist and even have him call us for a technical consultation to determine if you can use the ReBuilder under his direct supervision. Yes, in all likelihood it will. Cancer Treatment Centers of America do just that for their patients. Unfortunately, Medicare will not pay to prevent peripheral neuropathy. You must first have 3 months of symptoms documented by your physician and have tried other treatments. Your ReBuilder device now carries a lifetime warranty against defects in workmanship. Additionally, for loss or any accidental damage, you can trade in the damaged unit for 50% off a new unit at the published price. This warranty is also transferable to your children in your will. It is easy to initiate your warranty. Simply fill out and return your warranty card that comes with your ReBuilder within 10 days and you will receive a warranty number via e-mail. Keep this number handy and you can refer to it when you call for any warranty issues. No other medical product manufacturer we know of offers such a warranty. How can we do this? Your ReBuilder is manufactured right here in the USA by American workers. We have been manufacturing ReBuilders for over 27 years, and we know how indestructible it is. If your ReBuilder malfunctions, we will have you return it and we will repair it or replace it, and return it to you. If you have a problem, try our basic troubleshooting or give us a call and we may be able to diagnose the problem and fix it over the phone. We will give you a return order number for your replacement ReBuilder. Place this order number on the outside of the box. Send the ReBuilder (unit only, unless otherwise requested) back. For your records, write down the tracking number from the shipping company you select. We will repair or replace your unit, call you to see what carrier you would like to use, and ship it back to you. We have used the ReBuilder for the past 6 months on cases of peripheral neuropathy where symptoms of numbness and/or burning pain were reported. Over 80% of these patients reported significant reduction of these symptoms after 3 weeks, or 9 sessions, and currently 5 patients have obtained or in the process of obtaining their own home units. I suggest it be considered for treatment of balance-challenged patients when proprioceptive deficits may be attributed to loss of foot sensation. In these cases, we have found improved gait and performance on the CTSIB tests suggesting improved somatosensory function. Long-term benefits have not been assessed yet; we plan to monitor these cases for that purpose and to help establish a home protocol or continued clinical care plan. I found out about the ReBuilderTM in an unusual way. Normally, a detail man, employed by a pharmaceutical company buys the girls in my office lunch and then informs me about the latest drug, hoping I will write prescriptions for his drug rather than a competitors. What is unusual about the ReBuilder is that a referring physician, a family practice MD in our community, called me to follow up and report the success of a patient we had both seen who had presented with severe neuropathy, primarily pain and tingling in his feet and with concurrent difficulty sleeping. After unsuccessful treatments with Cymbalta, Lyrica and Neurontin, the patient was referred to me. I performed a nerve conduction velocity exam and found that there was a significant delay in the transmission of nerve signals in both of his legs. After exhaustive blood work I could find no reason for his symptoms and since he had already tried drug therapy with no resolution of his symptoms I referred him back to his GP. My friend reported that our patient had found a new device on the internet, bought it, used it, and now was asymptomatic after two months without drugs. I was cautiously intrigued, and requested that he return for a follow up so I could test him again to see if there was any objective, measurable, improvement. To my surprise and delight, I found that his NCV test was now normal. I requested full documentation from ReBuilder Medical and read with interest their monograph from the inventor, David B. Phillips, and found it to be highly accurate, educational, and taxing to read because of its intensive technical nature. However, it explained a new concept that makes total sense. I now prescribe the ReBuilder routinely. Of the 20 patients in my practice who have used the ReBuilderTM, all but one have experienced significant relief. Six patients were diagnosed with idiopathic neuropathy, 7 were diagnosed with impingement syndrome in the lower back or buttocks, and 6 suffered from diabetes. The one who did not respond suffers from long term uncontrolled diabetes and has the stocking feet” dark discoloration of his ankles and feet and has periodic glucose levels exceeding 500, with an A1c of 13. I urge all medical professionals who see patients with neuropathic symptoms to prescribe the ReBuilderTM as the preferred treatment before they have to resort to prescription drugs. Simply give us a call or drop us a line at support@decompressionpros.com.